Turn your iPad ideas into amazing apps with this exciting new guide! Whether you're app development amateur or programming professional, you'll discover how to get in on the App Store development gold rush and start developing for the iPad with this fun and easy guide. The iPad offers developers of all levels more opportunities than ever before to be a part of the app development game, and this book is your ticket to joining in the fun. You'll learn the basics of getting started, downloading the SDK, using context-based design, and filling your toolbox. Then you'll move on to using Objective-Cand Xcode to program robust and vibrant apps and games specifically for the mobile platform. * Offers a plain-English guide whether you're a novice or a seasoned developer who is interested in developing iPad applications* Covers working with the multitouch interface and in split-screen mode* Provides useful advice on what applications thrive in the App Store and which have the most potential to turn a profit* Includes a companion Web site with source code Packed with helpful advice on the ins and outs of developing great apps for mobile devices, iPad Application Development For Dummies gets you started creating cool new apps right away! Note: Apple's iOS SDK tools are only accessible on Intel-powered Mac and MacBook devices. Introduction. Part I: Creating the Killer App. 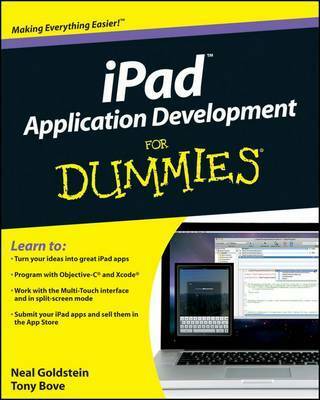 Chapter 1: What Makes a Killer iPad App. Chapter 2: Creating a Compelling User Experience. Chapter 3: The App Store Is Not Enough. Part II: Becoming a Real Developer. Chapter 4: Enlisting in the Developer Corps. Chapter 5: Getting to Know the SDK. Chapter 6: Death, Taxes, and iPad Provisioning. Part III: Understanding Apps. Chapter 7: Looking Behind the Screen. Chapter 8: Understanding How an App Runs. Part IV: Building DeepThoughts. Chapter 9: Building the User Interface. Chapter 10: Animating the View. Chapter 11: Adding User Settings and Gestures. Chapter 12: Getting the Bugs Out. Part V: Building an Industrial-Strength Application. Chapter 13: Designing Your Application. Chapter 14: Delighting the User at Application Launch. Chapter 15: Navigating Your Application. Chapter 16: Enhancing the User Experience. Chapter 17: Adding the Stuff. Part VI: The Part of Tens. Chapter 18: Ten Tips on iPad App Design. Chapter 19: Ten Ways to Be a Happy Developer. Index.